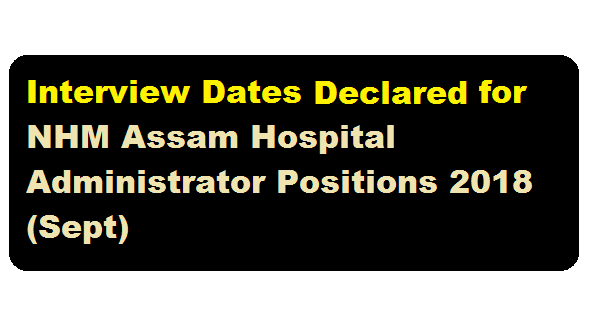 Interview Notice for NHM Assam Hospital Administrator Positions 2018 (Sept) :- Earlier, we have informed you about NHM Assam Hospital Administrator Vacancy 2018 (September) notification. The interview details has been out for the above mentioned post and the details can be found below. NOTICE FOR INTERVIEW FOR HOSPITAL ADMINISTRATOR POSITIONS UNDER AYUSHMAN BHARAT, ASSAM(JAN AROGYA ASONI) :- In partial modification to the the Advertisement for the HOSPITAL ADMINISTRATORS positions under AYUSHMAN BHARAT vide No. NHM-31013(12)/1/2018-HRD-NHM/e-1001 dated 24/08/2018, the date of publication of the shortlisted candidates has been preponed to 11/September 2018. The interview for the shortlisted candidates will be held on 12th September 2018 from 02:30 PM onwards at the Office of the Mission Director, NHM, Assam, Saikia Commerical Complex, Sreenagar Path, Christian Basti, Guwahati-781005. a)Only short listed candidates will be called for interview for which no TA/DA will be paid.